In the last 8 months the world has seen a wave of violent attacks on faiths. They have been attacks at the heart of our communities intending to divide us, inspire more hate and more attacks of the same. In October of last year eleven people were killed in the deadliest attack on the Jewish community in the United States. The terrorist opened fire on a congregation attending Shabbat morning services at the Tree of Life synagogue in Pittsburgh. In March of this year there were two consecutive terrorist attacks at mosques in Christchurch, New Zealand killing 50 and injuring 50 others. The terrorist opened fire on worshippers during Friday prayers. This Easter 321 people were killed and 500 injured in an attack on three Christian churches and four hotels. It is unclear exactly who the attackers were and what there motives were but again it was a clear attack on faith and community. These three attacks have been centred on attacking the heart and soul of communities. They have been inspired by ideologies of hate and nihilistic supremacism. The strongest response we can have is to show our love and support for one another. ‘Many of those who will have been directly affected by this shooting may be migrants to New Zealand, they may even be refugees here. They have chosen to make New Zealand their home, and it is their home. We are now sickened by yet another attack but our resolve will not be broken. We will continue to stand for one another and in solidarity. Our communities will not be divided and we will not succumb to hate. Selk, Avi; Craig, Tim; Boburg, Shawn; Ba Tran, Andrew (October 28, 2018). “‘They showed his photo, and my stomach just dropped’: Neighbors recall synagogue massacre suspect as a loner”. The Washington Post. “Police with the latest information on the mosque shootings”. Radio New Zealand. Stronger Together. The world proves terrorist Brenton Tarrant wrong. 50 killed including as young as three; a globe in mourning. A white supremacist with a camera strapped to himself hoping to gain fame as a hero and possible martyr for his successful mission in ensuring racial dominance has slaughtered 50 including a boy as young as three. 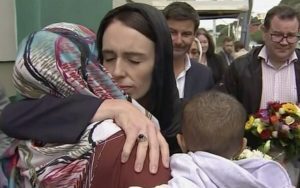 In his sickening, lethal manifesto he purports immigration to be destroying communities and he claims to be acting for many that share in his beliefs, but New Zealand and the world are inspirationally proving otherwise. At MAAS we are utterly heartbroken as we watch footage of parents who have lost children as young as three and watch the community grief stricken laying flowers at the mosques but whilst devastated we are also inspired by the international outpouring of love for the Muslim community of Christchurch. We are not white, black, Christian, Jewish, Muslim alone we are human and we stand together in humanity. 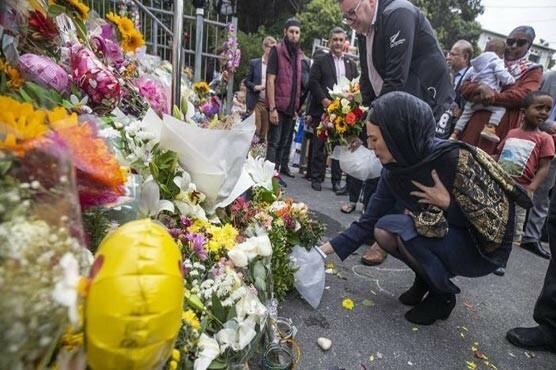 New Zealand comes together and shows us exactly what it means to stand together in solidarity for one another. A worker has been suspended amid an anti-Semitism row at the University of Essex. The member of staff has been suspended while allegations are independently investigated. The university said a Jewish society will be created on campus regardless of a vote in which more than 200 students opposed it. Concerns have been raised by the Union of Jewish Students over posts from the Facebook account of lecturer Dr Maaruf Ali, including one that read “the Zionists next want to create a society here at our university”. University of Essex vice-chancellor Professor Anthony Forster said: “To see the University of Essex associated with anti-Semitism has been a deeply shocking event and one which has filled me with great sadness. “Anti-Semitism is antithetical to the values of the University of Essex and has no place at our university. “We have a zero-tolerance approach to harassment and hate crime which is at the very core of our values and beliefs. “We are proud to subscribe to the working definition of anti-Semitism produced by the International Holocaust Remembrance Alliance (IHRA). The university said it will ensure a Jewish society is created irrespective of any ratification by the students’ union. It has launched a review to ensure Jewish students and staff are provided with unequivocal support and will hold a public event on February 28 in support of its Jewish community. The Union of Jewish Students said it was “deeply disappointed by the significant proportion of students” who voted against the establishment of a Jewish society and “dismayed” to see comments from the Facebook account of Dr Maaruf Ali. It said it welcomes Prof Forster’s condemnation of anti-Semitism and commends the “swift, strong and supportive action taken”. 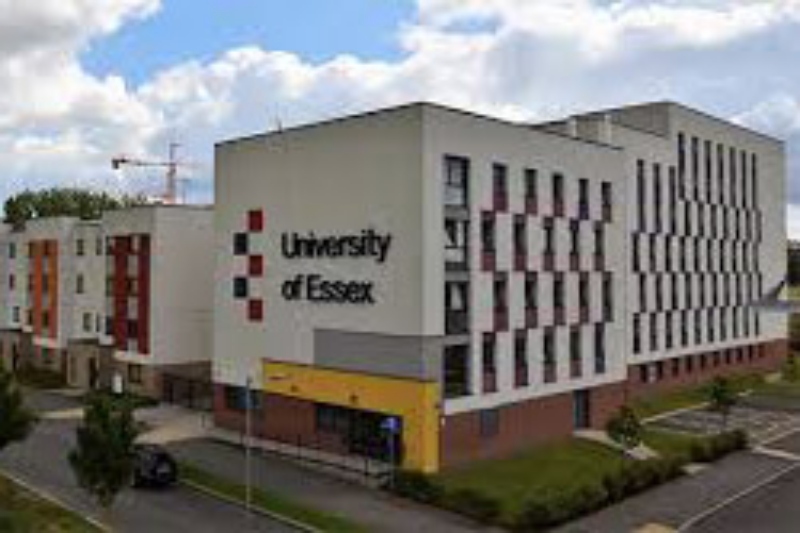 “There is certainly still a long way to go until antisemitism is eradicated from university campuses, but we are heartened that these steps will make a significant impact on improving the lives of Jewish students at the University of Essex,” the group said. Appalled and shocked my friend changed the topic of conversation. Over the next few days she decided to ask friends what they thought of this comment. I happened to be one of these friends, as we stood over the world’s largest stone scarab in the ancient Egypt exhibition of the British Museum, we came to a deeply troubling conclusion. It is a fact that Jews constitute 100 of the 400 richest Americans, which is strikingly high when you consider Jews only make up 2% of the world population. However this absolutely does not suggest an ‘evil’ and a conspiratorial level of control. In fact Tzedakah, the giving of charity, is a hard wired Jewish value and in this vein there are more charitable organisations per Jew than almost any other group. Also it is of course not a blanket rule that Jews are wealthy, there are many Jews in poverty: in New York 30% of people living in Jewish households are poor or near poor and the Jewish Chronicle recently dedicated a whole article to the question of shame around being poor and Jewish. But more to the point, a good attitude towards work and knowledge of business is no negative, it is the jealousy of the relative success of the Jewish people and emphasis put on it by society that has created a negative stereotype leading to the greatest horrors of history. There are other communities that put similar weight on education, take the Chinese as an example, identified as disproportionately ‘high flyers’ in the UK, however their relative success has not had them labelled as evil manipulators controlling the world. Since Roman times, Jewish people have frequently been depicted as wealthy, menacing and controlling. In these respects, Jews have been associated with Mammon, the deity associated with money, and Moloch, the Ammonite god associated with human sacrifice. It was this deeply held conspiratorial belief that lead to Jews being the scapegoat of Germany’s economic catastrophe pre WWII. It was this belief that then had them depicted as evil, selfish wealth grabbers that had their properties and businesses snatched on the night of krystalnacht where over 91 Jews were killed and over 7,000 Jewish businesses destroyed or damaged. Finally it was this belief that saw between 5 and 6 million Jews killed in the Holocaust. With this in mind you would think no young person would enter into banter connected to the same attitude that fuelled the largest orchestrated killing of a people in known history. It begs the questions what do young people know about the Holocaust and how deeply held are these anti-Semitic attitudes? Let us first give the young man the benefit of the doubt. He did attend a top ten university and may have been trying to impress his Jewish date with his quick wit. Let us assume that he is aware of the Holocaust and the anti-Semitism that drove it. You may think this is an obvious assumption to make but it really isn’t. As a recent survey has shown one third of Europeans ‘know little or nothing about the Holocaust.’ Moving into the pre-history exhibition we decided it was likely that he isn’t within the one third that knows little to nothing of the Holocaust, however he maybe one of the quarter that believes Jews to have too much influence in business and finance, thus a part of and adding to a new wave of anti-Semitism that is striking a deep fear into our Jewish communities. In fact this new rise in anti-Semitism has caused such fear that one third of Jews are considering leaving Europe. We then tried to further extend our empathy to this young man. Was it not just a joke? And when does a joke become a problem? We quickly concluded, as we moved past a recreation of a pre-historic Levantine burial site, that jokes naturally rely on stereotyping and that jokes often are dangerous and controversial in nature. However a joke that relies on the stereotyping of an at-risk minority, that has faced genocide as a result of said stereotyping and when said stereotyping strikes such fear into our Jewish community then it is no longer funny. We concluded that there are some jokes that base themselves in such painful parts of human history, which use stereotypes that still pose a threat to the target of the joke, that they become dangerous. As a society we need to pay careful heed to the roots of stereotypes, the history of their effect and the current risk they pose. If a minority is still at risk and you are entering into what you consider to be ‘harmless banter’ then you are a part of the problem. There has been a 29% increase in hate crime since last year and over 700 anti-Semitic incidents recorded in the first 6 months of this year alone. There is a real need for minority groups to stand in solidarity with one another in these troubled times. With knowledge that positive content online lasts longer and propagates further, we will be developing and sharing content that showcases our positivity, our solidarity and our commitment to tackling prejudice together. Hear from our Outreach and Network Development Manager on what we will be doing and why. MAAS will be building a library of useful aids to challenge anti-Semitism. We will take manifestations of anti-Semitism and provide useful means to help you challenge them. First in this series we are looking at collective blame and conspiracy theories surrounding 9/11. 9/11 has seen hateful narratives created against both Muslims and Jews and in seeing how both of theses narratives have been created, their basis and why they are both false and dangerous we hope that you will have useful information to challenge these perceptions yourself. Twin towers: The Jews did it! The Muslims did it! Conspiracy theories might seem crazy, sometimes amusing but definitely not worth our time or attention. Wrong. Conspiratorial blaming around the twin towers provides a strong example as to why we must pay heed to conspiracy theories and dedicate time to challenging them. On September 11th 2001 the Islamist extremist group, al-Qaeda, used four passenger airliners as weapons to attack the United States killing 2,996 people and injuring 6,000 others, causing Wall Street to close, resulting in a global economic downturn and closing civilian airspace in the US and Canada for two days. Despite the catastrophic effects this terror attack had on civilians and the economy, some adopt a belief that all Muslims were tacitly involved, or that it was not an Islamist extremist terror attack at all but an attack by the Jews. The thinking is this: 9/11 was perpetrated by Muslims therefore all Muslims are a threat. This kind of thinking saw hate crime against Muslims rise from 28 reported incidents to 481 in 2001 following 9/11. It is the type of thinking that results in consistent spikes in anti-Muslim hate following Islamist inspired attacks. It relies on the belief that all Muslims are ideologically aligned and violently inclined. It is in fact a very easy fallacy to contest; firstly Muslims believe in a number of different interpretations of Islam belonging to a number of branches and can never ideologically be treated as a whole. 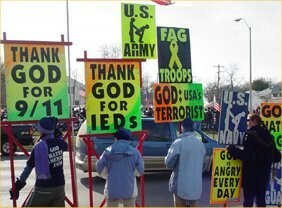 A useful parallel to draw here is with the Westboro Baptist Church: this widely reviled Christian sect spreads hate speech and is considered a hate group by nearly everyone, yet no-one would consider this group to be representative of Christian belief and practice as a whole. Secondly even of those who adopt an extreme literalist interpretation of Islam are unlikely to believe in violent Jihad as a means to achieve religious/ political goals. For example, Saudi Arabians whose dominant faith is Salafi/ Wahabism, which insists on a literalist interpretation of the Qu’uran, and has been accused of laying fertile ground for terrorism, mainly emphasize dawa and reform as a way for spreading their ideology rather than violence. A useful parallel here is violent attacks perpetrated by the far right: even the most right leaning people in this country abhor far right violence like the killing of MP Jo Cox, yet they continue to disagree with her politics and may be accused of laying fertile ground for future violence. To conclude here there are a plethora of beliefs within Islam and even the distinct minority who adopt a literalist view are very unlikely to agree with violent measures. Therefore, despite the attackers of 9/11 being Muslim it does not follow that all Muslims should be considered a threat. Hezbollah’s television station Al-Manar ‘reported’ that 4,000 Israelis employed at the World Trade Centre did not show up for work that day because they were told in advance of the attacks. This then became central to the conspiracy that it was Israel and the Jews, not Al-Qaeda, that perpetrated 9/11. In fact it is estimated that 400 Jews died in the attack. Unfortunately, a conspiracy theory like this is not surprising: there is a concerning popular point of view that Jews control world affairs. A recent CNN survey showed that 28% of Europeans believe that Jews have too much power over business and finance. Again, we see a diverse and complex group treated as a whole. This is complicated further by conflating being Jewish with actions of the state of Israel. Jews hold a variety of different political and ideological views, and not all Jews believe in the Zionist ideology (the belief in a right to a Jewish homeland) and then many Zionists do not agree with Israeli state action. So to treat all Jews as a whole and to consider all Jews to be supporters of and actively involved in Israeli state action is again a fallacy. Both theories have elements of collective blame. Collective blame is the punishing of the whole for the actions of a few. In these examples Muslims are collectively blamed for terrorist attacks and Jews are collectively blamed for disasters according to an association with Jews and power, wealth and global control. The problem with collective blame, according to neuroscientist Emile Bruneau co-author of Interventions highlighting hypocrisy reduce collective blame of Muslims for individual acts of violence and assuage anti-Muslim hostility is that “If you collectively blame an entire group for the actions of individuals, it makes it totally reasonable to exact your revenge from any person from that group… You get a cycle going on where each cycle is motivated to commit violence against totally innocent members of the other group.” The obvious example here is the Holocaust. The Jews were blamed for the economic problems Germany faced and were painted as a threat to national security and prosperity. As the nationalist propaganda began to take root, the majority of German citizens accepted, encouraged and even participated in the mistreatment of Jews under Nazi rule. To give an even more direct example, Kristallnacht, when 267 synagogues were destroyed and an estimated 90 Jews murdered by the SA and civilians, was seemingly in response to the assassination of the Nazi German diplomat by a German- born Polish Jew, but can be seen as a direct result of shifting blame collectively, where one Jewish person’s actions were used to instigate aggression of the whole community. As this article has shown, conspiracy theories and collective blame should not be treated as a joke. In the fight against the rise in both Anti-Muslim hate and anti-Semitism conspiratorial thinking, sweeping generalisation and collective blame must be consistently challenged. An easy way to do this is to get accustomed to the common conspiracy theories, do some research on the facts and keep them ready for potential discussions that head in this dark direction. Pointing out hypocrisy and ‘fake news’ are the best way to challenge the theories. As well as pointing out how dangerous conspiracy theories and connected collective blame can be. 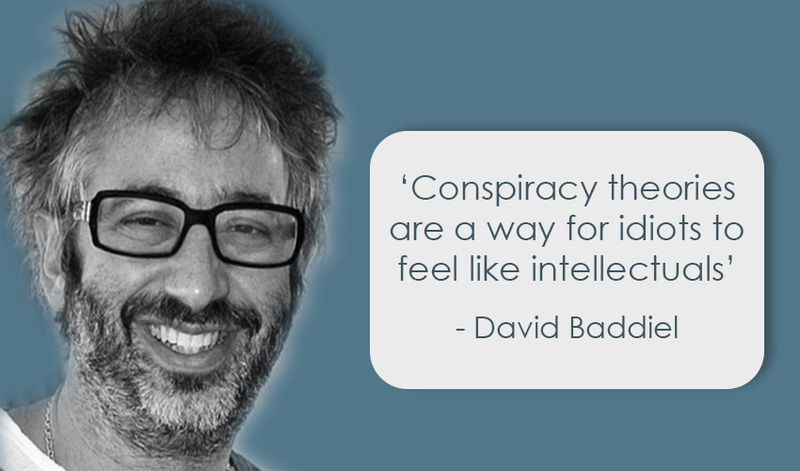 It may also be useful to consider why conspiracy theories are formed at all. Conspiracy theories are often created to either shift blame from a certain group or pin blame on another group. It is no surprise then that Jewish conspiracies surrounding 9/11 are widely held across the Middle East. Another reason may be to make sense of reality when it goes against set beliefs, for example: those who do not believe that we had the technology to go the moon, may adopt conspiracy theories advocating that the moon landing was faked. They can also empower the conspiracy theorists with a sense of superiority as they might feel they know something others don’t, and that they have unmasked something that those in power do not want them to know. When asked the reasons of our fervour against antisemitism, we might be tempted to scoff at the questions and the suspicions that an obviously Muslim organisation fighting so vociferously against antisemitism might engender, yet we resist the temptation to dismiss such concerns out of hand. Not only because we understand there are so many other issues our brothers and sisters from all faiths might want us to consider, like islamophobia, Israel and Palestine, on one side of the spectrum, and gender equality, and homophobia on the other, but because we firmly believe in the power for change our approach will bring to all issues. Let me elaborate. We are keenly aware of all the problems our society and communities face, and in an ideal world, every humanitarian organisation should deal with all issues at all times, and perhaps our exclusive focus on such a divisive topic might be a justifiable reason to view our endeavour with surprise or even mistrust. 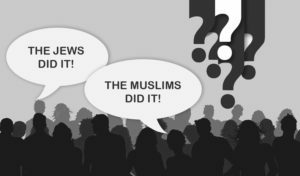 It is, however, not just a case of arbitrarily picking a controversial issue for the sake of it, but rather of believing that creating a momentum within the Muslim community towards the fight against antisemitism, is a way towards a solution to all the most pernicious and problematic issues all our communities face, and specifically a catalyst in the fight against islamophobia. This is more logical than the counterintuitive nature of the statement might suggest: bias, the cause of prejudice, is rooted in natural, and seemingly benign assumptions we all quite innocently and automatically make in our attempt to make sense of the world. The cognitive processes we employ in our day-to-day decisions, favour an all-encompassing approach to reality and human interaction, without which the level of information needed to deal with reality in a totally unbiased way would be too great. “There are three men on a train. One of them is an economist and one of them is a logician and one of them is a mathematician. And they have just crossed the border into Scotland (I don’t know why they are going to Scotland) and they see a brown cow standing in a field from the window of the train (and the cow is standing parallel to the train). In Haddon’s book the joke is told by the protagonist to extol the superiority of maths over all the sciences, but it is a good example of how our brain works, and how complex reality requires a lot of data processing. The case of the cow in the field in Scotland is a simple example of a rather simple reality, the problem is that we tend to make observation about very complex realities in the very same simplistic way. This is not because we are foolish or careless, but because, as already seen above, we cannot be wasting time every time we glance outside the window of a moving train to consider all possibilities. The consequences of these cognitive shortcuts are insignificant when it is a cow in a field quickly disappearing from view, but become problematic when we apply this quick decision making to the complex realities of human behaviour and belief. As The Guardian’s science correspondent Hannah Devlin puts it in her article Unconscious bias: what is it and can it be eliminated? And this is why the colour of the cow is ultimately so important: by rejecting our normal cognitive processes when dealing with complex realities, we are less prone to fall prey to prejudice, and it is also why by challenging our most difficult issues, like antisemitism in Muslim communities, we are better placed to engage with an open mind with other issues that affect us all. Furthermore, by visibly engaging with worthy campaigns, whose influence will benefit people we do not normally affiliate with, we win more support for causes which more directly affect us. Put simply, when we hear a Priest lending support to LGBT+ tolerance, an imam eloquently exposing antisemitism, or a rabbi vociferously opposing islamophobia, we are not only more likely to sit up and listen, but we might also give a better chance to ideas and concepts we might have not been entirely open to up to then. Lou Fioravanti is a Senior Researcher with Muslims Against Antisemitism. We cannot escape the frightening reality that hate is on the rise: Hate crime is up by 29% on last year; far right political parties have gained a terrifying level of support across Europe and the crisis in the Labour party surrounding anti-Semitism has uncovered a dangerous level of mainstreamed, poorly challenged anti-Semitic thinking. In tandem with the rise in physical and political manifestations of hate we have also seen the online space being increasingly used to share dangerous hateful views. The parliamentary inquiry into the role of social media companies in addressing hate crime and illegal content online found that extremism is growing online in parallel with the growth of social media. Last April, Assistant Chief Constable Mark Hamilton, the National Police Chief Council’s hate crime lead, said that there had been a significant increase in online hate crime over the last 24 to 36 months. YouTube was found to be awash with videos that promoted far-right racist tropes, for example titles that included: “White Genocide Europe—Britain is waking up”, “Diversity is a code word for white genocide” and “Jews admit organizing White Genocide” as well as holocaust denial videos including “The Greatest Lie Ever Told”, “The Great Jewish Lie” and “The Sick Lies of a Holocaust ‘Survivor’”. How do we stand a chance against such bleak numbers and statistics? What can we as a community on and offline set against such hate? The middle ground that opposes far right extremism, Islamist extremism, homophobia, anti-Semitism, gender inequality is woefully silent. This puts us in great danger of our human rights based values becoming second place to hate and intolerance. Evidenced most recently in the UK’s refusal to give Asia Bibi, accused of blasphemy in Pakistan, asylum allegedly owing to fears of unrest here in the UK. With the rise of digital and social media we have the same opportunities to speak up as radical groups do. We too, can fill the void. We can step into the public space and counter negativity and disregard for human life with positive messages and counter-narratives. There have been great examples of communities making a stand #MeToo being one of the most prevalent movements. #MeToo reached millions of people around the world and gave those who had previously silently suffered a voice. Recently in response to a sickening letter calling for a ‘punish a Muslim day’ in April 2018, communities across the UK stood up and spoke out against such bigotry and hate. #LoveAMuslimDay encouraged individuals and communities alike to show unity and solidarity. that good men should look on and do nothing. With an unacceptable rise in intolerance in our society it is time we took to the platforms that hateful extremists are using already to spread their islamophobia, homophobia, xenophobia, anti-Semitism and misogyny and make a stand for the shared values that unite our diverse nation. 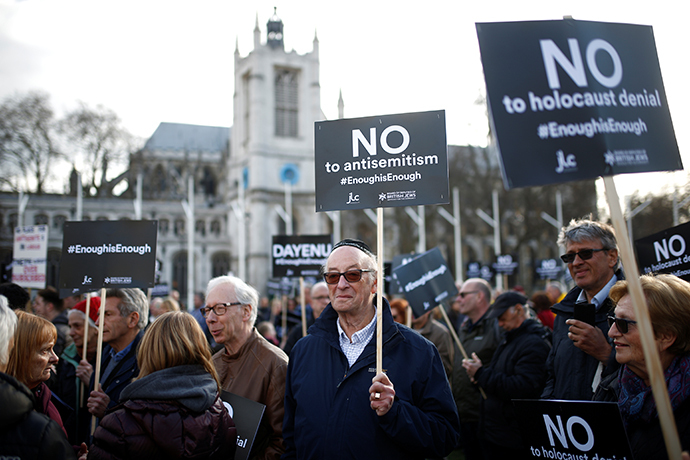 Muslims Against Anti-Semitism will be working with communities to build a grass-roots movement that tackles the particular challenge of the rise in Islamophobia and anti-Semitism. We want to be a part of turning the tide on hate by challenging bias and will be using the online space to platform positive voices who share our values of tolerance, equality and individual liberty in order to do that. Watch our twitter @MAAS_UK and don’t be afraid to get in touch, join the community and get involved. Watch out for events and campaigns to come to and get involved in! Win the War? I’m not Fighting! We live surrounded by invective, toxic opinion, and a lot of SHOUTING. It is hardly surprising or blameworthy: there’s a great deal wrong with the world, and trying to be part of the solution is difficult and frustrating. Add to that the time pressures we are all under, the imperative to always produce and excel, so prominent in the corridors of power and in our work place, and you have the ingredients for very bitter exchanges. But what if the methods were part of the problem? What if, in the race to turn up the volume and causticity of our utterances, we were causing irreparable damage? Or even worse, what if, by virtue of our combativeness, we were increasing our chances of defeat? Intellectual debate has always relied on juxtaposition of different ideas, the very nature of thought formation occurs in neural connections made of electrical sparks, and reasoning is always made more fertile when challenged, yet the nature and rigour of the discourse is far more important that it is given credit. The reasons differ from what may be immediately apparent, like the basic need to keep a civilised exchange going and leave the debating floor with our integrity intact. In fact, having a more impassioned and rational debate helps us ‘unpick’ the automatic thinking that underpins so much of bias, prejudice and conflict. That is not to say that we should shy from ‘calling out’ injustice and malfeasance as we see it, but by concentrating on the causality in our opponents’ motivations, we will make our argument stronger and more incisive. The main problem with much of the acerbic exchanges on the media sphere is the ‘othering’ of our interlocutors by placing them into an immutably wrong conceptual space, allowing us to gain confidence in the righteousness of our position by virtue of contrast with it. That is very much like the processes we employ, mostly unconsciously, when we make decisions based of biased premises. The, now infamous, often quoted faux pas by Jeremy Corbyn, who referred to Zionists as having no understanding of ‘English irony’, is a very good example to illustrate this point. The point, however, is not whether the term is legitimately used, but that this process of creating a conceptually inflexible, all encompassing ‘other’ absolves us from reassessing her/his future utterances on their specific merits, and sanctions our treating of such utterances as the manifestations of a group that is intrinsically wrong, and therefore cannot contribute anything of value to the debate. In other words, it allows the more prejudiced amongst us to say that Zionist is ‘a thing’, like ‘women’ or ‘gays’ or ‘lefty’ and believe that everyone in that ‘group’ behaves as a single entity. That is the same process we have employed in our biased decisions in our places of work, our courts of law and our social circles across gender, class, abilities, sexuality, religious and other perceived divides, in prejudiced structures whose mechanisms we are increasingly uncovering and struggling to make reparations for. My point is that by frankly scrutinising our own arguments before making them public, we not only increase the mordancy and incisiveness of our arguments, but we also escape the vicious cycle of quick judgement and biased perspective. In the debate about religious intolerance, these tendencies are exacerbated by the perceived immutable nature of God’s wisdom, and the various manifestations of holy utterances. Yet the mistake is to attribute these immutable qualities and infallibility to the very mutable and fallible human nature and all its manifestations and conflicts. It is no coincidence that when learned people: imams, rabbis, priests, philosophers, and others deliberate as a group, after studious reflection, their conclusions are inclusive and moderate. So we should learn from the likes of Socrates, reflect on the conclusions of the Amman Message and The Bahrain Declaration on Religious Tolerance, and draw strength and perspective from the moderate sides of the argument, who are measured in their statements not out of weakness, but because of a strong and compassionate understanding of the inability of mankind to adhere to the perfection of God, Truth, and Justice. The emphasis is then on the process of seeking a path, rather than the appropriation of a predetermined, inflexible way. In conclusion the way we really fight prejudice is by dismantling its complex structures into their small, often seemingly innocuous pieces. We must do this because human beings are intrinsically creatures of prejudice and coming to terms with it will help us navigate the small actual differences that divide us, and recognise the vastity of the common traits we share. Reduce the world to binaries and moral absolutism and everything can be processed with extreme simplicity. Intellectual legwork is never required, introspection deemed unnecessary, when dealing with complex situations because rhetoric around imperialists, anti-imperialists and capitalism has created an immutable moral framework for the world. In this the protagonists and antagonists are clearly defined and context and political nuances become irrelevant. Within politics this creates intellectual trappings where some fail to progress beyond the material they studied in colleges and universities, imprisoned in a hate of America and capitalism that might have seemed a bit more rational had it not been set against their silence towards politically inconvenient atrocities and adoration for communism. If you’re a leftist, you are automatically good. If you are on the right, you are the scum of the earth, allied with imperialists and capitalists. And no one for sections of the far left are worse than Jews and Israel. There is nothing wrong with focusing on the Palestinian conflict. As an ethical socialist, I regard it as a moral necessity to protest against Israel’s human rights abuses, just as we should protest against any country that abuses these rights. But the intellectually impoverished far left do not stop there. And it’s their view of capitalism and Israel that needs to be understood when looking at the sharp rise in left-wing anti-Semitism in Britain today. In their world of clearly defined antagonists, Jews, or at least the wealthy ones, are posited as one of the chief threats to equality and fairness. They are the schemers and plotters who control the media, who are behind atrocities. The rhetoric around Israel drips in contempt that extends far beyond activism for Palestine. After all, if it was the case that they sincerely cared for the Palestinians they would protest Assad’s bombing of the Palestinian camps in places like Yarmouk. 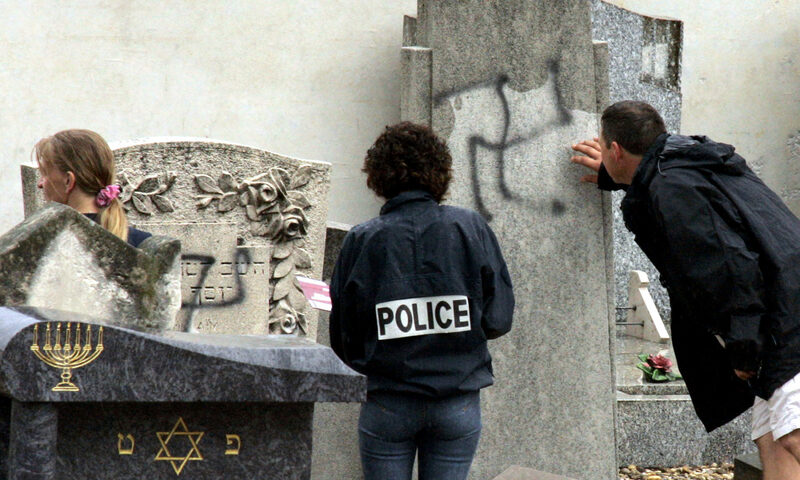 Virulent anti-Semitism has often been tolerated under the guise of being an anti-Zionist. In the name of battling for Palestine and being against capitalism, terrible tropes about Jewish people have been allowed to filter through in left-wing spaces. Sometimes the tropes are not immediately recognisable, dressed up in anti-capitalist, pro-Palestine messages. Bankers are seen as the embodiments of capitalism but in far-left discourses, also posited as being Zionists. Israel are seen as behind everything, the puppeteers dangling us all. It plays on the classic trope where Jews are the masters manipulating everything. For Illuminati or freemasons, read Jews. For controlling the media, see Jews. Labels of establishment and the elite exist across the far left and far right and both are seeped in racism. On the far right, it speaks scathingly of liberals who hold soft views regarding immigrants, refugees and Muslims. But on the far left, concealed behind the discussions on capitalism and its flaws, it implies Jews. This has flared sharply on the left within the Labour Party recently and has been poorly handled. The political tribe that once recognised racism as something to defeat today views it as a smear against the left, and more specifically, against Jeremy Corbyn. A movement that builds itself around the man rather than the idea will always fall apart when he does. And so it has happened here when accusations around Corbyn’s laxness towards anti-Semitism didn’t galvanise the left to combat racism but instead accuse Jews of whipping up a conspiracy against him. 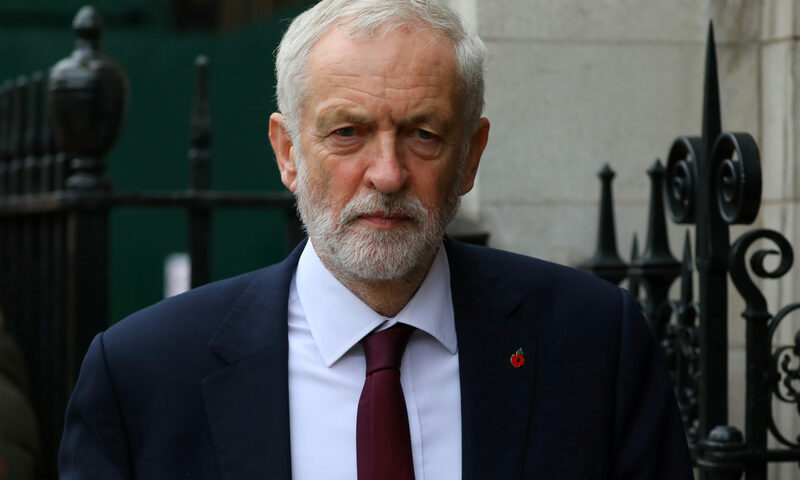 From sharing platforms with Holocaust deniers, defending a racist mural, laying wreaths for anti-Semitic terrorists, Corbyn has done little to fight anti-Semitism and shown very little sincere interest in fighting it. Bring this up and you hear talks of Cable Street and lifelong campaigning against racism. Anti-racism isn’t something you say but something you do, and where it has concerned him at the most pivotal point in his political career, Corbyn has failed miserably. His allies have spoken of fighting anti-Semitism and yet at every turn been more concerned about free speech than fighting bigotry. They have continuously absolved him at every turn whilst maintaining the pretence that the left consistently fights racism. Part of the problem is the premise that racism is a combination of power and prejudice, and as Jews are seen as powerful, cannot ever be victims. So when Jews are attacked or abused, sympathy for them is not what it would be say for blacks or Asians. This is not what socialism looks like. This not what it should ever look like. Rabbil Sikkdar is a British Muslim writer and has previously published in the New Statesman, Independent, I and Left Foot Forward. OUR NEWS SECTION IS A PLATFORM FOR DEBATE WELCOMING DIFFERENT OPINIONS, WHICH DO NOT NECESSARILY REPRESENT THE VIEWS OF MAAS.